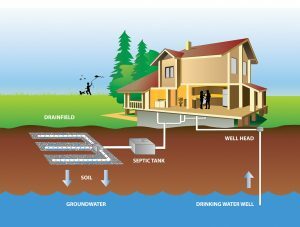 Many Thurston County residents have an on-site septic system in their backyard that treats the wastewater from toilets, dishwashers, laundry, showers, tubs and more. The nearly 53,000 septic systems in Thurston County treat about 12,000,000 gallons of sewage per day! In order for your septic system to do its job, it needs regular inspections and maintenance, also helping to protect your investment and our community’s drinking water. Regular maintenance of your septic system has many benefits, the first one being sure that you and your family have a functioning system to handle all of your household sewage! Regular maintenance means having your septic system inspected every 1-3 years and getting on a regular pumping schedule. Most households need to have their tanks pumped every 3-5 years but an inspection can help you decide when you need to pump. Regular inspections can also find small, inexpensive problems while they are still small, saving time and money in the long run. Regular inspections that can find and fix problems also ensure the health of your family, community, and our environment. Failing septic systems create a serious financial burden on you as the homeowner (the average cost for replacing a septic tank and drainfield is more than $12,000!). Failing and improperly functioning septic systems can contaminate lakes, rivers, streams, and Puget Sound as well as groundwater, which is the drinking water source for most of us in Thurston County. Failing systems can lead to outbreaks of disease, shellfish harvesting downgrades, beach closures, contaminated drinking water wells, low dissolved oxygen levels in marine waters that harm fish and wildlife, and algae blooms. Common, minor repairs found during septic tank inspections typically cost only a few hundred dollars and can prevent the side-effects of a septic system failure. Simply saving water in the home can help extend the life of your septic system. Quick showers, water-saving appliances, and spacing out water use throughout the week will make sure there isn’t too much water to treat at one time. Avoid flushing solids such as cigarettes, tampons, baby wipes, and grease into the system, and avoid using a garbage disposal. It’s also important to avoid driving or parking a vehicle on the septic tank and drainfield areas to prevent pipes from breaking and soil from compacting. Don’t use septic tank additives since they don’t replace the need to pump your tank and may be expensive and do more harm than good.